LED Outdoor Christmas Lights Are Here Nashville! Icicle lights are so 90’s. LED holiday lighting is here and it is the best investment you can make in holiday lighting and decorations. We’ve all heard a lot about LED technology. It is green. It’s very energy efficient and that’s especially important when we’re doing Christmas lighting which we will have on for many hours. We have LED Christmas lighting both for your home and also for your outdoor decor but today I want to give you some information about our outdoor architectural holiday lighting. It’s called Lightlinks. Lightlinks are LED light strings that we install!! The idea is similar to the old icicle lights. 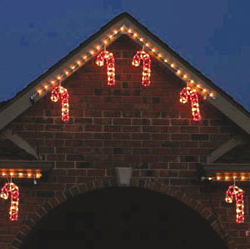 They are a string of lights that run across your roof line or various roof lines. They are a subtle, sophisticated and very festive holiday lighting decoration from your home. When I say subtle, I don’t mean hard to notice by any stretch of the imagination. They’re very easy to notice but they are incredibly classy. Now for a little more fun, we can also program the lights to chase and blink. We do all of that for you with our free installation. For a peek at all the light links designs we have, take a look at our Facebook holiday lighting photo picture album page with all the designs. 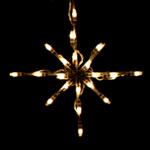 Better yet, click the “like” button at the top of our holiday lighting page and we will give you $25 off your order. 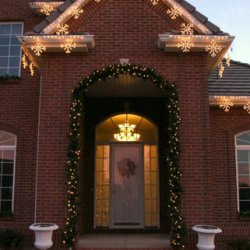 Give us a call today to order your holiday lighting. We will install it for free. We will also uninstall it for free and store it for you for next year. This entry was posted in Christmas Lighting, Holiday Lighting, Lighted Candy Cane, Lighted wreath, Nashville Christmas Lighting, Nashville Holiday Lighting and tagged Christmas lighting, holiday lighting, icicle lights, LED lighted Christmas, LED string lights by outdoorlightingnashville. Bookmark the permalink.